The new co-head of Kosovo’s negotiating team with Serbia has changed his colors so often that many analysts fear the once popular activist has lost his former credibility. In a February day, as he climbed the stairs of Prishtina Basic Court, Shpend Ahmeti left behind years of political activities that had made him one of the most popular politicians in Kosovo. Inspired by a public debate on a tender to supply schools in Prishtina with milk, he was taking his former party, Vetevendosje, to court for defamation. After submitting the lawsuit, he accused its leader, Albin Kurti of being behind allegations made against him. “He throws stones and hides his hand… It would be good to go face with him on all topics, and not hide behind others,” Ahmeti said. Enver Robelli, a Kosovo-born journalist working in Switzerland, sees the recent accusations of his former Vetevendosje friend as a consequence of Ahmeti’s decision to support Ramush Haradinaj’s government, by backing many of its initiatives in parliament. He said Ahmeti was locked in “a dirty war with his former party, with accusations and counter-accusations, while his new party, which is still untested in elections, has got closer to the government, with him becoming co-head of a quasi-negotiating team in the dialogue with Serbia”. 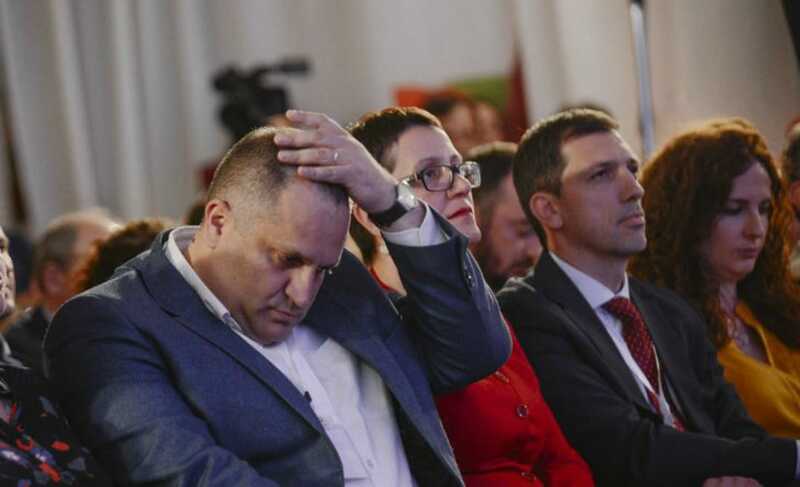 Once an important political double act, Kurti and Ahmeti parted company in March last year, when Ahmeti cut loose following months of disagreements in Vetevendosje. Inauguration ceremony of PSD, 2018. Photo: Atdhe Mulla. Two months later, Ahmeti took the helm of the Social Democratic Party, PSD, a party formed in the early 1990s that has enjoyed little success since then. Twelve of Vetevendosje’s 32 MPs joined him, establishing their own parliamentary group. Bekim Baliqi, a political sciences lecturer at Prishtina University, says changing positions and political convictions is not unusual in Kosovo, whether or not the changes contradict with previous behavior. “But the price that can be paid in these circumstances is a loss of credibility, and an inability to convince the electorate what convictions are important,” Baliqi said. “This is the problem that Ahmeti and his PSD are facing, because his criticism of his [old] party looks insincere – and they do not represent a proper opposition that has come up with any policies, or another government program,” he added. Baliqi says Ahmeti’s PSD now criticizes the opposition parties more than the coalition parties in government. In 2010, as an outspoken civil society activist, Ahmeti gathered many young well-educated people around a political party named Fryma e Re [New Spirit]. It was quickly suffocated as it failed to pass the 5-per-cent threshold in the next parliamentary elections needed to enter the assembly. One year later, Ahmeti and other New Spirit representatives joined Vetevendosje, in a bid to open the party up to new faces and create a new profile for the “troublemaker” movement. In 2013, after establishing himself as one of Kurti’s top associates, the Harvard Kennedy School graduate surprised many when, as the Vetevendosje candidate, he defeated the leader of the Democratic League of Kosovo, LDK, Isa Mustafa, in the race to become mayor of Prishtina. It was the first time that the LDK had lost control of its Prishtina stronghold in 13 years, after four consecutive local elections. He repeated this electoral success, although with a narrower margin of only around 300 votes, in November 2016, when he defeated another LDK candidate, Arban Abrashi, after a marathon vote count. But the festive atmosphere within Vetevendosje turned bittersweet as cracks emerged in its ranks only weeks after the elections. Simmering tensions then erupted when party founder Kurti expressed his intention to run for the party chairmanship in upcoming internal elections. A group of senior figures in the party opposed this idea and threatened to quit Vetevendosje, which they did, one after another, along with Ahmeti. PSD officials say that after a wave of heated polemics with Vetevendosje, the atmosphere has now calmed down. “It is normal for parties to make criticisms and remarks about each other… but they should focus on programs and political actions and not on defamations and libels to try and stain their opponents,” Shqipe Pantina, a PSD MP told BIRN. “As is happening now, yesterday’s enemy can become today’s friend, or vice versa,” the MP added. “We should remember the insults and libels that members of Vetevendosje, of which we were part in that time, made toward the LDK and its leader [Mustafa],” Pantina noted, recalling the days when Vetevendosje challenged the former PM’s initiatives by letting off tear gas in parliament and staging protests in the streets. “This kind of speech and this form of political opposition, which has become hugely degraded, should end,” Pantina added. Robelli says that when Ahmeti won his first election to become Mayor of Prishtina in 2013, he personified “the hope for change”. But he says this feeling of hope had faded away four years later, by the time Ahmeti won his second term. By then, “he looked more like an accidental mayor, due to his lack of results in his first term,” Robelli told BIRN. This frequent visitor to Prishtina sees no big changes in the Kosovo capital’s infrastructure as occurring under Ahmeti’s tenure. “Like in the past, Prishtina maintains the repulsive charm of its boring communist architecture, mixed with post-war urban chaos, where stale glass façades dominate buildings and where walking across the city for a pedestrian is a permanent challenge,” he observed. “The changes that started in Prishtina have stalled,” he added. He also expects Prishtina’s numerous problems to be left behind now that Ahmeti is preoccupied with the EU-led dialogue with Serbia. “He is now dealing with major issues… He is dreaming of a political career at national level,” Robelli maintained. But the main issue for Ahmeti’s new party, according to Robelli, is that is has yet to face an election. When the Prishtina think tank, the Kosovo Democratic Institute, KDI, published an opinion poll in September 2018, the results suggested that the PSD would fare badly in an election. A party cannot gain seats in the Kosovo assembly if it does not pass the 5-per-cent threshold. Dardan Molliqaj, a PSD MP, told BIRN at that time that the party was in fact performing better than the poll indicated. He claimed that support for the PSD at that time actually stood at “around 6.2 and 7.2 per cent” of the voters. “I cannot speak now about figures, but the PSD will be a political force of great value in the Kosovo assembly in the coming elections,” Molliqaj predicted. “Whenever elections are held, you will see that [the results] will be completely different [from the opinion polls],” he added. 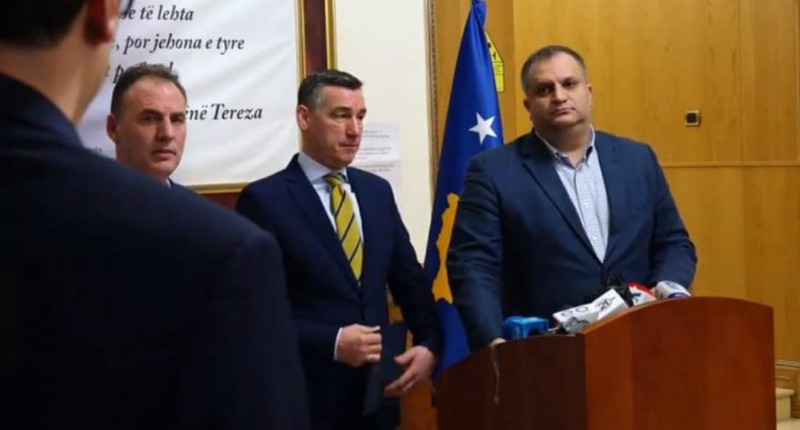 But Bekim Baliqi believes it will be difficult for the PSD to consolidate its presence on Kosovo’s fragmented political spectrum in the next parliamentary elections. “It will be almost impossible for them to consolidate themselves in the field and obtain promising results in the coming elections,” he said. “The best possible option [for the PSD] is to join a pre-election coalition, if it is to survive politically,” Baliqi said. 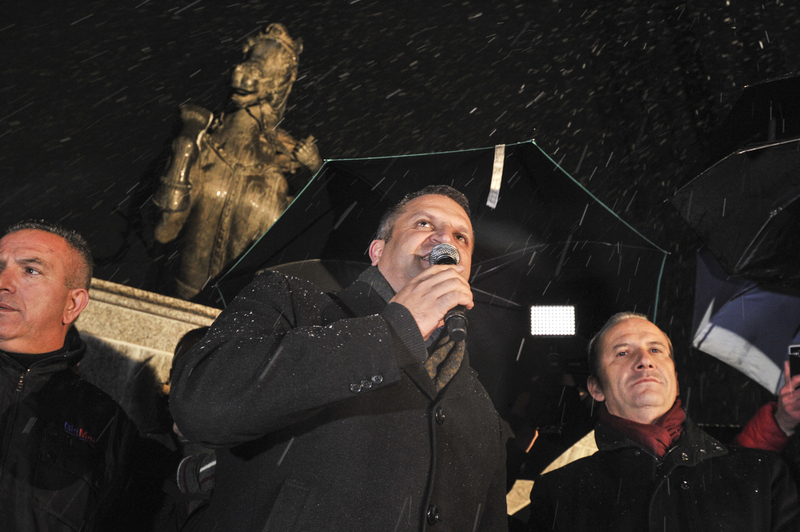 Since the publication of the poll, the PSD has made several controversial moves. They included three of its senior figures, including the leader Ahmeti, joining the government’s negotiating team with Serbia. Press conferences with PDK’s president Kadri Veseli and NISMA’s leader Fatmir Limaj as part of the negotiation team. Photo: BIRN. 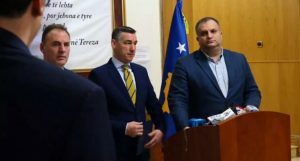 The party also supported the government’s proposed budget for 2019, under some conditions, at a time when Haradinaj’s cabinet clearly lacked the support in parliament to push forward its initiatives. Back in January 2015, Ahmeti was arrested in Prishtina while protesting against the dialogue with Belgrade. But PSD MP Pantina sees no great contradiction between Ahmeti’s actions then and now. “During his time in Vetevendosje, Ahmeti did not object to the dialogue as a tool to resolve conflicts but to way how the dialogue with Serbia was being developed. “This is why the PSD has decided to use its influence, as much as it can, to change the form of the dialogue,” Pantina told BIRN. Whether the PSD will pay a price for its involvement in the controversial dialogue remains to be seen. Bekim Baliqi says it is too early to judge how Ahmeti may perform as head negotiator. “But his introduction to the negotiating team … was not well thought, and it will cost him in the coming elections,” he predicted. He does not think that Ahmeti will reap much fruit from the process, even if Kosovo does gain the much-sought recognition from Serbia at the end of it. “In such processes, merit goes to those who have promoted themselves the in negotiations, while the blame and damage are shared among all the participants,” Baliqi said, adding that Ahmeti’s possibilities to change anything in the course of the dialogue remain limited. While the international community waits for Kosovo and Serbia to come to terms this year, in their quest for the full normalisation of relations, PSD MP Pantina says that, within the party, there are no worries about how the party’s involvement in the dialogue will effect its votes in elections. “There are times in politics when the issues go beyond government mandates; we should not think about votes; this is a moment when parties should leave vote calculations behind,” Pantina said. Meanwhile, according to Pantina, joining the negotiating team does not mean the PSD will ensure the current government survives. “Our parliamentary group has already submitted signatures for a no-confidence motion against the government and, whenever that is put to a vote in parliament, we will support it,” she added. Whenever they are held, the new elections will show the real force of the PSD in Kosovo politics. But few analysts feel convinced by Ahmeti’s actions thus far. They note that, only two years ago, he would barely shake hands with the head of the Kosovo Assembly, Kadri Veseli. Now, as the head of the negotiating team under new party colours, he holds joint press conferences with him. “In the Balkan political stock market, the goods that are sold the cheapest are principles,” Robelli concluded. Illustration: Trembelat for Prishtina Insight.